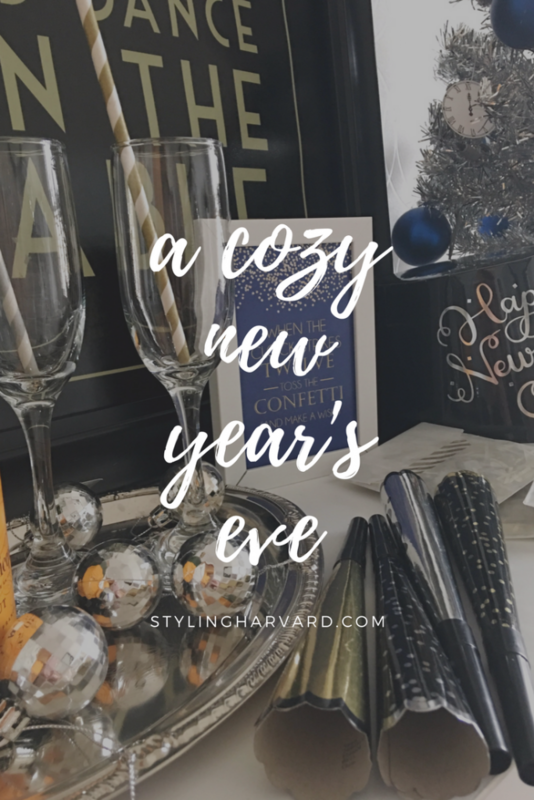 I’ve never been a huge fan of going out of New Year’s Eve. I hate getting all dressed up, especially when it’s so cold out. I don’t mind going to friends’ or family’s houses nearby but that’s my limit. Major old lady over here! Maybe I’d feel differently if I didn’t live in New England. When Jamie and I were in Mexico last month, we talked about maybe going away for the New Year one day. I think it’d be fun to celebrate somewhere different! With that being said, I love being cozy at home on NYE. A couple of years ago, we had a small family party where we played games and watched pre-ball drop shows. It was lots of fun. 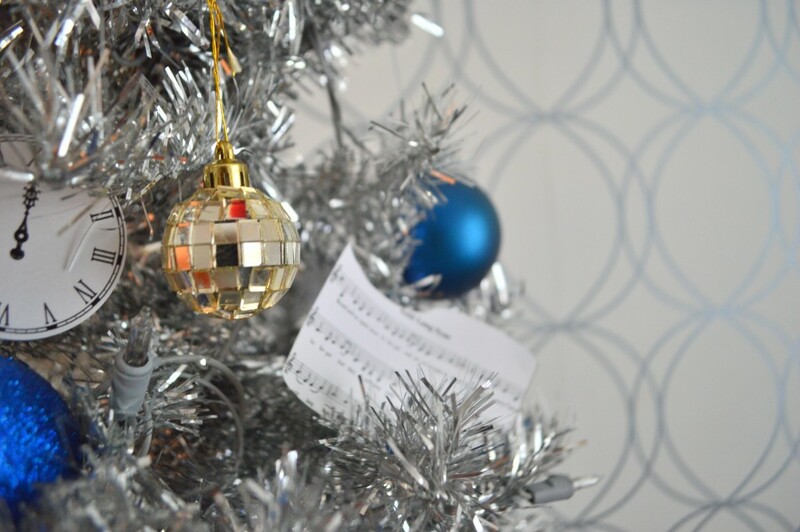 You probably know by now that I have a slight obsession with Christmas trees. 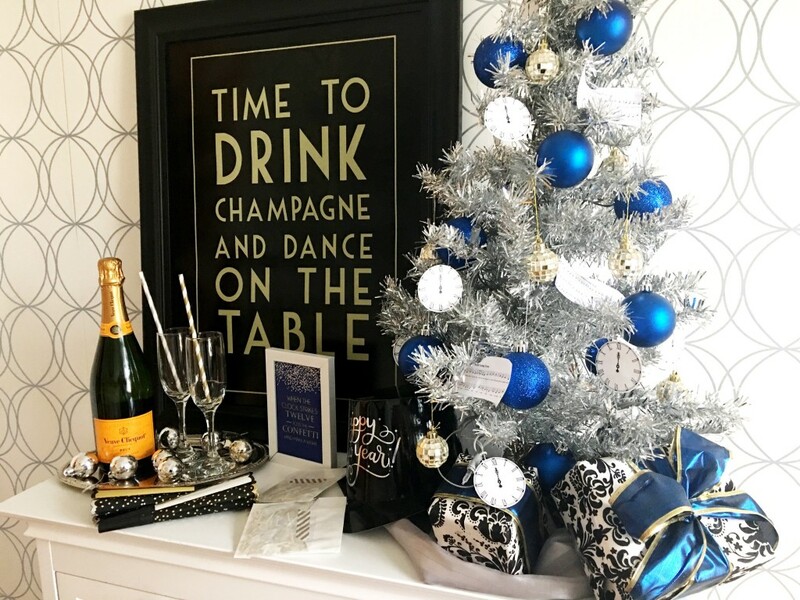 I used our silver tree which had an NYE theme and spun off of that for the decor. 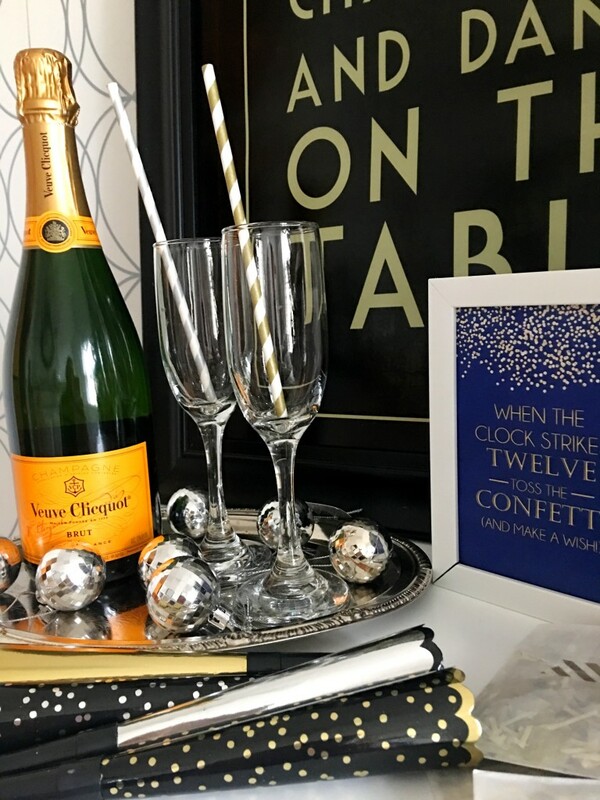 I went with silver, gold, black and midnight blue for the color scheme.We kept the food simple with apps and desserts and everyone brought something. I blew up metallic balloons and scattered them around the floor. 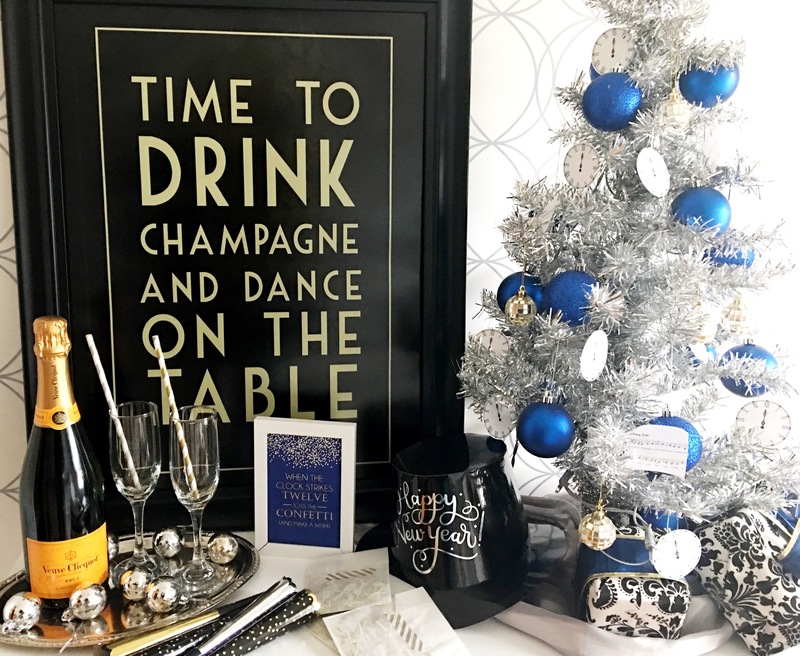 Of course no New Year’s Eve party is complete without champagne. I used one of my favorite prints as a backdrop. It’s the former story of my life…you know, when I was young and cool, haha. I made some fun printables that are great for reusing year after year. If you regularly follow along, you know I talk about my love of champagne and prosecco. A lot. 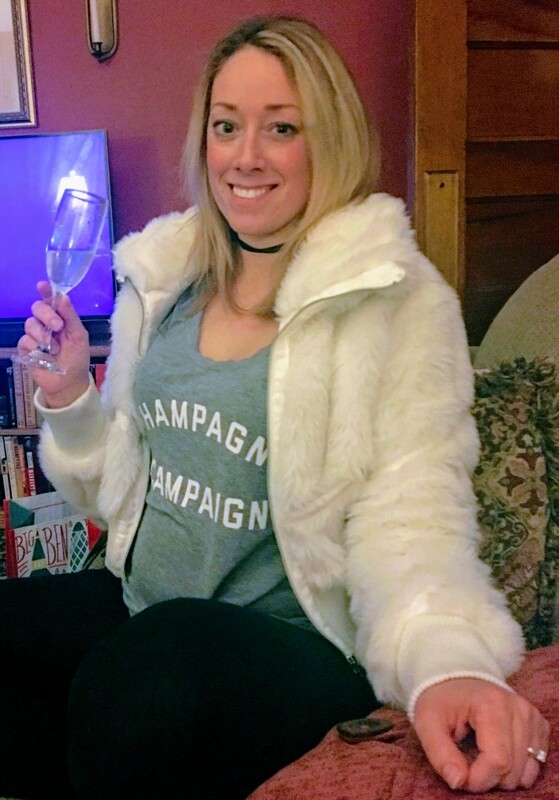 I own at least 5 champagne/prosecco related shirts and if I see another one, I’ll probably buy that too. I love mix casual comfort with glam. For New Year’s Eve, I wore my comfiest champagne shirt with leggings and a faux fur jacket. 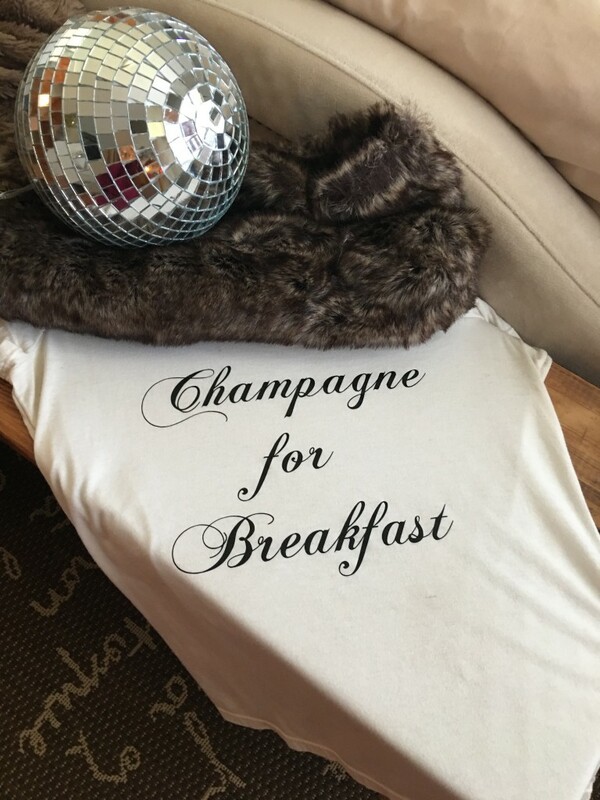 I paired my Champagne for Breakfast t-shirt with a faux fur scarf for New Year’s Day brunch. This is a fun tradition Jamie and I started a couple of years ago. We go out for a fancy brunch and since we’re not party animals, we almost always have the restaurant to ourselves while everyone else is sleeping off the hangovers! Wishing you all a happy, healthy and blessed 2018! Cheers!